The duchess.. came toward us. She looked enchanting, attired in a gown of ivory satin with a low neckline, high shoulders, and sleeves of delicate voile. The skirt was smooth with small butterflies delicately sewn through it, the ends of their antennae accented with tiny gemstones that caught the light. Around her neck was a flawless sapphire surrounded by diamonds. In her gloved hands she carried a fan of peacock feathers. observations: The Duchess is the former Consuelo Vanderbilt, who at this time was the Duchess of Marlborough, living at Blenheim Palace. Many of the characters in the book are real people: the Duke, the Duchess, the Duchess’s mother, the young(ish) Winston Churchill, Gladys Deacon who became a subsequent Duchess of Marlborough, the painter John Singer Sargent. The narrator is fictional: a young architect (significantly named John Vanbrugh) and his wife called in to do some work at the extremely grand stately home. The action takes place over the titular weekend, and there are all kinds of murky deeds and deadly goings-on: it is a (fictional) murder story. Mr Morrissey certainly seems to know his stuff about Blenheim – there are elaborate descriptions of the building. The murder plot sits uneasily with the real-life complications and very difficult relations among the characters, but it is quite compelling. I did not find the conversations very convincing, and not because they weren’t authentic to the 1905 date. They weren’t, but they also didn’t sound like any dialogue that anyone ever had, at any date. It’s a strange, uneasy book: it feels as though the author went to considerable trouble over it, but it also feels odd to be ascribing such very extreme deeds thoughts and actions to real people. Pictures by John Singer Sargent have featured on the blog several times. Consuelo Vanderbilt was an American heiress who married into the British aristocracy: Frances Hodgson Burnett’s The Shuttle looked at a similar fictional story at around the same time. 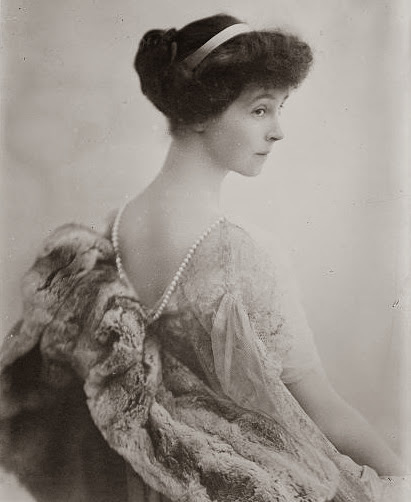 The picture of Consuelo Vanderbilt is from the Library of Congress. It'll be a cold day in hell before this one ever appears on the library shelf! I think I would sooner take up crochet as a hobby - but hey you know what I'm like. See how I'm doing you a favour? No threat to your book-buying embargo. I read this book almost 10 years ago and I loved it. Don't remember why I loved it but I did. My husband bought a hardback copy this year at the book sale. I hope he likes it better than you did. I would think about rereading it but have too many books... you know the story. I'll be interested to hear what your husband makes of it. As for re-reading - there just isn't time is there? Moira - I'm glad you've mentioned Consuelo Vanderbilt. I've always been fascinated by her life as reflective of the lives of so many wealthy heiresses who were married to titled 'gentry' who needed an assured source of wealth. Sorry that the dialogue didn't ring true for you, but the book sounds interesting. Oh me too! The whole thing is fascinating, I will always read a book on the subject: the clash of cultures used to such dramatic effect - and often some sadness for the rich girls (with apparently perfect lives). Even Downton Abbey has that in the background - though the marriage was happy in that case.